IVO SANADER IN FRONT OF PARLIAMENT with Mario Zubovic (left), one of the eight Members of Parliament on whose loyalty he can countDespite forecasts that he would, former Croatian Prime Minister Ivo Sanader, who recently took his seat in Parliament, will not work from the house to bring down the administration led by his successor Jadranka Kosor. The reason is very simple - he would have little to gain from the technical ouster of the HDZ-led Government and the resulting early elections, and there is a greater chance that this turn of events would be very damaging to him, as he would lose his immunity as a Member of Parliament and the opportunity to launch public attacks against his former party political colleagues. It is more likely that Sanader will instead use the floor of Parliament for other purposes, the most important of which he considers to be to take on the people he sees as his greatest enemies - and these are above all Prime Minister Jadranka Kosor and other key people in the HDZ such as Vladimir Seks. SANADER'S OTHER AIM is to use his appearances in Parliament, and the entire political show he has put on these past weeks, in an attempt to convince the Croatian public at large that he is still a major political player and that he has not entirely lost his political clout and influence, regardless of everything that indicates the opposite. And finally, the attempt to project an image of Sanader's power is largely targeted to the former head of the Customs Administration Mladen Barisic, who is sitting in police detention in Remetinec prison and wondering whether or not to finally betray his great friend and former boss and by doing so to seal Sanader's fate before the judiciary. REGARDLESS OF THE massive media attention Ivo Sanader has generated over the past few weeks with his return to Croatia, his testimony before the parliamentary inquiry into the privatisation of oil company INA and in reactivating his mandate in Parliament, it has not changed the fact that he is politically dead; that is to say that there is no perspective to his continuing political career. There are many reasons for such an assessment, but is suffices to say that Sanader no longer enjoys absolutely any kind of international support, that he has lost the public's confidence and his good standing since his unexplained flight from the post of Prime Minister and his ejection from the ranks of the HDZ (Croatian Democratic Union), and the trust and status he enjoyed within the HDZ itself. And his name has for some time now quite openly been linked to numerous corruption scandals. As a result it is clear to many that Sanader does not have, and can never again have, an important role to play in Croatian politics, and that the sole and exclusive aim of his latest moves are selfish in nature - to try in any way possible to avoid arrest and to stop investigations into corruption scandals in which his name is mentioned. MANY IN CROATIA are now aware of this, including former party political colleagues, and as Nacional's sources point out, even some of Sanader's friends who are, allegedly, still loyal to him. Which is precisely why those who have a better understanding of the balance of power in Croatian politics feel that with propaganda missives about a possible toppling of the current administration from Parliament benches and about setting up his own club of deputies, Sanader is only trying to convince everyone that he still has clout and that he is a threat to the ruling party, and the message is clearly also targeted to persons who might denounce him before judiciary bodies. This, of course, pertains above all to the former head of the Customs Administration Mladen Barisic, who many feel could definitely "bury" Sanader, although others should not be excluded in this regard, including Nevenka Jurak, Ivan Mravak, and perhaps even former Deputy Prime Minister Damir Polancec. AND THERE ARE TWO KEY problems to a possible Sanader plan to bring down the Government led by Jadranka Kosor in Parliament. To really bring down the HDZ majority in Parliament, Sanader would have to win over a number of HDZ deputies. 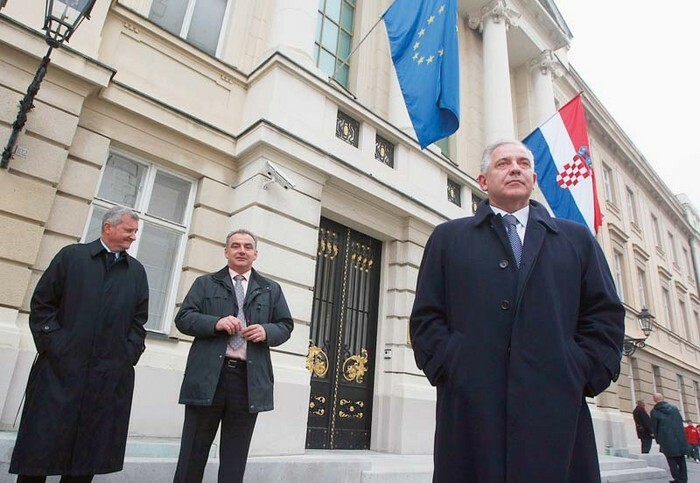 There has been a great deal of speculation over the past few days concerning Sanader's declared friends, and of his "sleepers," Members of Parliament who have so far been nominally on the side of Prime Minister Jadranka Kosor and the HDZ leadership. Behind the scenes a figure of five, or even as many as nine MPs have been mentioned that the former Croatian prime minister could rally to an independent club of deputies. Topping these lists have been Sanader friends like Luka Bebic, Jerko Rosin, Petar Selem, Mario Zubovic and his former right hand Bianca Matkovic. Besides them there is evidence that former union leader Boris Kunst, who Sanader in fact recruited to the HDZ in 2007, could also take his side. Along with them there has been a rumour of late in the HDZ of two "sleepers" that have not to date been associated with Ivo Sanader, these being MPs Bozica Solic and Ivan Bagaric. And, finally, if he were to be released from police detention in Remetinec prison and take his seat in Parliament, Sanader's conspiratorial group would quite certainly also be joined by Mladen Barisic. Until then Barisic's seat in Parliament is held by HDZ deputy Durdica Sumrak, who sources say is a friend of Prime Minister Jadranka Kosor's, from which it can be concluded that she is an MP that Sanader probably cannot count on. Nevertheless, although there is a possibility that Sanader might actually try to set up his conspiratorial group in Parliament, one ought to pose the question why any of these people would demonstrate an unparalleled amount of political short-sightedness in crossing over to the side of a person that has for a year now had the reputation of being the most negative person in the country? And even if this plan of Sanader's were to succeed it would lead to the fall of the Jadranka Kosor administration and early elections in which Ivo Sanader, and anyone connected to him, would have little or no chance of success, and by all accounts a possible independent Sanader election slate would be hard pressed to even make the election threshold. And it is therein precisely that lies the root of the doubt in the realisation of a Sanader plan to bring down the current administration - it would cost Sanader his immunity from legal prosecution as an MP which does, albeit in a mostly declaratory fashion, shield him from criminal persecution, while he could, following a round of elections, face a loss of this immunity and the concrete results of his unpopularity among the citizenry. RUMOURS OF NEW SLEEPERS There have been rumours in the HDZ of late that parliamentary deputies Bozica Solic (photo) and Ivan Bagaric are loyal to SanaderTHE SITUATION IS SIMILAR for his possible co-conspirators. Instead of completing a full term in Parliament and possibly winning their seats again as HDZ candidates at the next elections, Sanader's sleepers could find themselves in a very bad position. They would lose their fifteen thousand kuna a month wage and the benefits that go along with the job, and their then-former colleagues from the HDZ would certainly see to it that they made their lives miserable in any way they could. And while it is illusory to believe that Croatian politicians act in keeping with elevated political motivations, any possible Sanader followers would quickly face a painful and real fact - besides the goal of preventing his criminal persecution, detention and possible trial, former Croatian Prime Minister Ivo Sanader has absolutely no other political goal that any of his followers could adopt as their own political platform. And that is why it is hard to expect that what Ivo Sanader is trying to blackmail the current HDZ leadership through his friends with will ever happen. He would have more to lose than to gain if the current HDZ-led government were to fall, and to achieve that he would have to find deputies in Parliament stupid enough to want to openly stand on the side of a sure election loser. And there are, surely, too few of these.